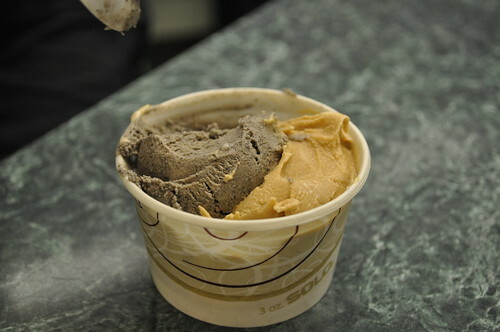 After dinner at Izakaya Sozai, Bill and Pam took us to Marco Polo Italian Ice Cream over in the Outer Sunset area. During a previous visit to San Francisco, my extended family (including my mom) spent some time with Bill and Pam. Incidentally, they had brought them all to this small gelateria, which in many ways, is quite unconventional (more details on this later in the post). My uncle Frank, the one of the pickiest eaters I know (one with extremely high standards--barely anything satisfies his palate enough for him to commit said food item to memory), was unconvinced to try a taste of anyone's gelato. My aunt Cynthia (his wife) kept insisting that he had to try it because it was just that good--she knows him better than he gives her credit for, that much I'll say). He stayed adamant and obstinate for a while until he couldn't take it anymore. To put to rest any more nagging (though I wouldn't put it that way--it's more like palate restoring) surrounding the mysterious gelato flavors from Marco Polo, he finally decided to take a try. Boy, did Auntie Cynthia win total rights to do the "I-told-you-so" dance for the rest of the night at Marco Polo because he totally fell in love with it and continued to rave about this gelateria to everyone he knew once he returned to the Tri-State area after the trip to San Francisco. I still hear about it today, and even before Marcus and I had left, he told us to make sure to stop at "that gelato place--you know, the one Bill and Pam took us." Bill and Pam took these orders to heart, leading to them bringing us there no later than the night we arrived to town. 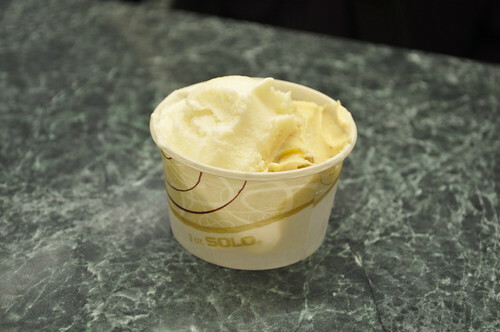 Marco Polo Italian Ice Cream has been around since 1982. Pam told me that she and her sisters used to go there when they were growing up, as it was just around the corner from where her parents lived. She also noted the place hasn't changed since, in both flavors, décor, and operations. Its flavors, the quality that undoubtedly makes this place stand out from other conventional gelaterias, are inspired by Asian ingredients (e.g., black sesame, guava, durian, green tea, red bean, taro, jackfruit, etc.) that you don't typically see used in the traditional Italian preparation of gelato. To be able to taste a good range of gelato flavors offered by Marco Polo, I had lychee (left) and guava (right) in a small cup. While I've had lychee sorbet before, I've never had the pleasure of trying lychee flavored gelato, let alone lychee gelato with chunks of real lychee incorporated into it! 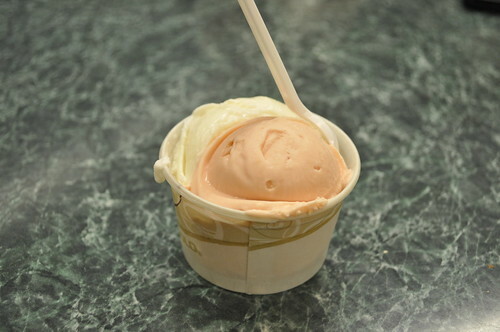 It was really light and refreshing--it was almost like a lychee sorbet but creamier. As for guava, which I absolutely love and wish were available fresh over on the East Coast, it was very refreshing, too, though it was definitely blander in flavor than the lychee flavor. I liked the combination of the two together as their tastes tend to balance well together as tropical fruits. Marcus had a small cup with sesame and Irish coffee. The sesame tasted fresh and toasted, just like a bunch of crushed black sesame seeds churned with cream. The Irish coffee flavor was slightly stronger than the coffee flavored gelatos and ice creams that I've had before. It was quite rich and flavorful--just as aromatic as a fresh cup of brewed coffee with a splash of cream for taste and color. Pam went with a small cup with coconut (left) and pistachio (right). The coconut was refreshing and fragrant, while the pistachio, like all pistachio-flavored gelatos, was lovely with its rounded, soft nutty flavor. If there's any gelato that you're sure to get, it'll always be the pistachio one. Bill got a small cone with fresh banana walnut (top scoop) and arcobaleno (bottom scoop), which is a combination of vanilla, pistachio, almond, and chocolate. The combination of these two flavors were more on the savory side (creamier and heavier use of chocolate). The fresh banana walnut effused the flavors of ripened bananas and contained the crunch of real walnuts, while the arcobaleno was just a swirl of gelato's best ingredients. I really enjoyed the arcobaleno as it seemed like you were getting multiple flavors all in one roll-up of a gelato flavor. 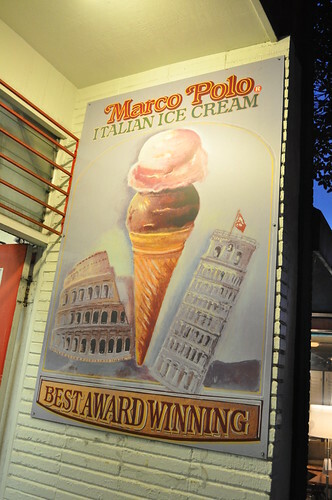 Findings: I think a trip to Marco Polo Italian Ice Cream is a must in San Francisco. The concept of using these Asian-inspired ingredients that are atypically seen incorporated into the churning of any "flavor" of Italian gelato. And when tasting the flavors, it's like you're having a freshly whipped dollop of light cream mixed in with the real ingredient (a fruit, chocolate, or nut--whatever is applicable). Can't beat that kind of experience in taste! Sesame, arcobaleno, guava, and lychee were my top favorites--ones you should consider ordering. I guess a key benchmark for me is to always notice when Uncle Frank is raving about a meal, restaurant, or something of the like constantly--you'll definitely know the food will be amazing because his palate wouldn't accept anything less than that. 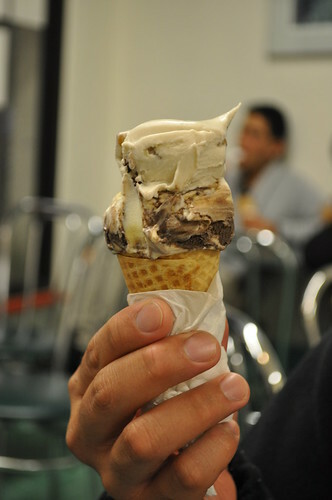 Price point: $3.35 for a small-sized cup or cone (1 to 2 flavors).